Life is something most of us often take for granted. We never think about how quickly it can be ripped from us, and when it is taken from someone we love we shut ourselves completely down, locking our drive to live our own lives away. 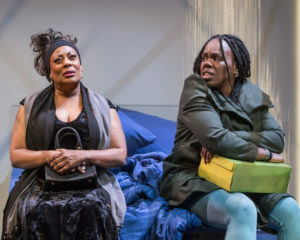 Ngozi Anyanwu’s “Good Grief” which opened at the historic Kirk Douglas Theatre on Sunday gives clear insight into these themes and shows us all that just because one life ends, doesn’t mean yours has to. The play tells the story of Nkechi (played by Anyanwu), a girl of Nigerian descent growing up in the suburbs of Bucks County, Pennsylvania between 1992 and 2005. Flashbacks reveal her earliest childhood friend, Matthew Jason George, or “MJ” as she calls him. After MJ tragically loses his life in a car accident in the play’s opening scene, we are taken on Nkechi’s journey of being consumed with grief for someone who may have actually meant much more than a friend to her. Carla Renata and Ngozi Anyanwu in the world premiere of “Good Grief. The cast includes top notch performances from Wade Allain-Marcus as the eccentric loveable MJ, Dayo Ade as the stern but comedic Papa, Marcus Henderson as Nkechi’s scene stealing “Bro”, Omoze Idehenre as the hilarious Nene, Carla Renata as MJ’s grieving mother, and Mark Jude Sullivan as Nkechi’s former classmate JD. The role of Nkechi is played by the playwright herself, displaying a visceral range of emotion as she speaks the powerful words she has written. Ms. Anyanwu’s introductory note in the program suggests the play is somewhat autobiographical. While still, a work of fiction she tells us that that she conjured MJ out of someone she missed as well as her longing for herself when she was younger. The play offers it’s fair share of nostalgia, with familiar music of the 90s as well as references to hit TV shows and video games of the era. Another major factor worth noting is the superb lighting design by Pablo Santiago, particularly in the gripping yet haunting final scene in which MJ (in flashback) tells Nkechi of what he perceives it feels like to die. The audience is suddenly immersed in the incredible lighting and with one final gasp lifts us to our feet in thunderous applause. “Good Grief” runs at the Kirk Douglas Theatre until March 26,2017. Don’t miss it. Tickets for “Good Grief” start at $25, and can be purchased at the Kirk Douglas Theatre Box Office or online at centertheatregroup.org.